JIM VAIKNORAS/Staff photo Timothy Friend, 14, sits ot the GAR Memorial Library on one of two benches that convert into picnic tables. 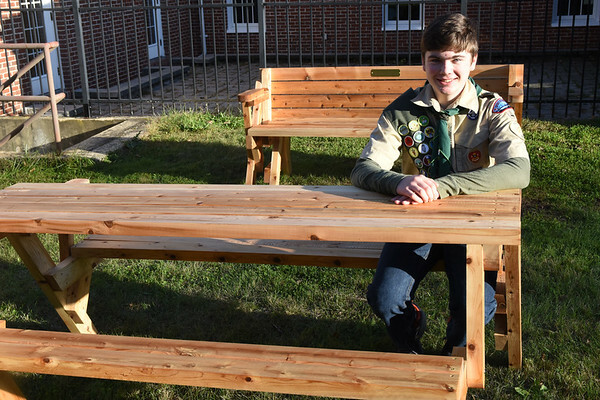 A member of the Merrimac/West Newbury Boy Scout Troop 41, Friend made the benches out of white cedar wood and weather proofed them as part of his work towards achieving the rank of Eagle Scout. He also raised $520 through a bake sale, which he donated to the library to enhance the book collection in its teen room. Friend, who lives on Main Street, has been visiting the library weekly with his family since he was a toddler and wanted to do something special for it as a thank you. The Pentucket freshman has three remaining merit badges to complete before becoming an Eagle Scout. His Court of Honor will likely be scheduled in 2018.